Let’s see if I can come up with a post every day of the rest of the offseason. Today, there are 17 days left until Opening Day on April 6. 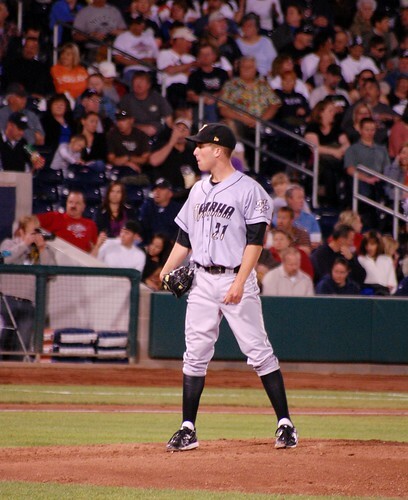 One of Danny Duffy's few games with Omaha. is a lot of fun trivial little numbers from the Royals’ last season: the number of double plays into which Jeff Francoeur* grounded, the number of bases Alex Gordon stole, the number of runs Brayan Pena scored, the number of runs Everett Teaford gave up in the Majors, the number of batters Joakim Soria walked, the number of runs Danny Duffy gave up in Triple-A, the number of innings Kelvin Herrera pitched for Omaha, and so on. It’s also Chris Getz’s uniform number. It’s also the approximate amount of time, in seconds, that is needed to deconstruct the acquisition of Humberto Quintero. The Royals need a catcher with MLB experience to fill in until Salvador Perez’s knee heals. Quintero is that, and was available for a reasonable price. Ta-da! OK, that’s oversimplifying it a bit. The deal could actually become a mess at some point when the PTBNL is named. Kevin Chapman wasn’t too terribly much to give up for a couple of MLBish players, which means the PTBNL will be someone of more value. How much more? Furthermore: Where does Jason Bourgeois fit in, and why? The Royals are stacked with speedy CFs and other sundry fourth-outfielder types on the 40-man. We have Jarrod Dyson and Derrick Robinson in the former category, and MITCH and David Lough in the latter. And then there’s Lorenzo Cain, who is legitimately good enough to start every day in center field, is probably a better hitter than Bourgeois, is younger than Bourgeois, and whose name I already know how to spell. This does kind of look like the end is near for our dear Mitch Maier. If it is, that means the end of the “Mitch Maier Writes Home” series at Royals Review, and that is unacceptable. Process: UNTRUSTED.